To stop the downward spiral, in 2008 CR’s new management made a conscious effort to improve processes and accessibility of the call centers by putting extra resources into efforts to address the most urgent short-term issues. In 2009, strong guidance from the management team ensured that CR operations were once again able to satisfy at least basic customer expectations. With this goal achieved, in early 2010 the Customer Relations management team formulated plans to continue with the deployed organizational development activities in order to increase the organization’s level of performance from average to high. 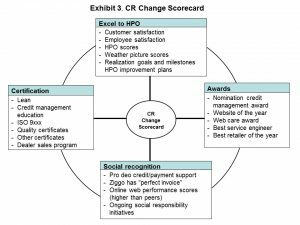 The management team also decided to apply the HPO Framework to help Customer Relations achieve its goal of becoming a high-performance organization. Using the HPO questionnaire, all Customer Relations managers and employees scored their department’s performance on the 35 HPO characteristics from 1 (very bad) to 10 (excellent). Subsequently, the scores for the five HPO factors were calculated, analyzed, and depicted in a graph. To be an HPO, an organization needs to have a score of at least 8.5 on all five HPO factors (Waal, 2012a). As Exhibit 2 shows, the Customer Relations department, as expected, was not an HPO. 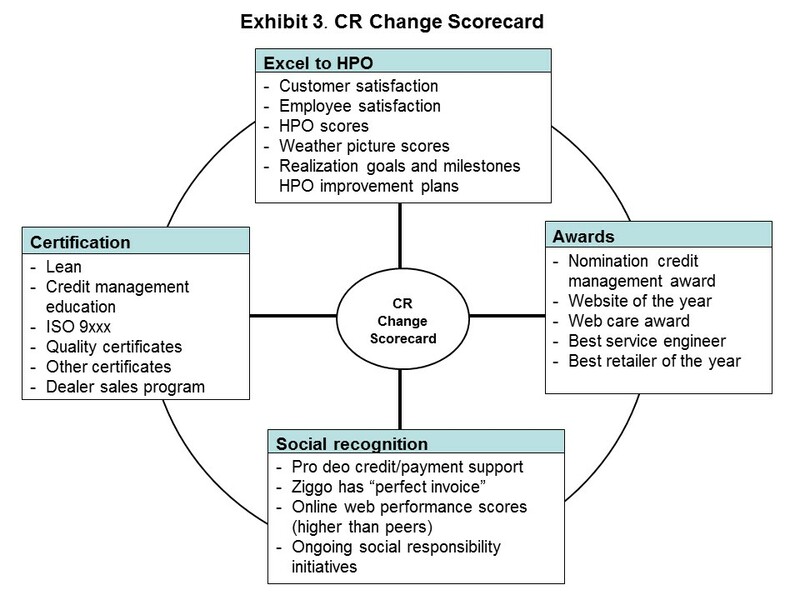 Exhibit 2 also indicates the HPO factors that needed to be strengthened in order to improve the performance in the Customer Relations department. The HPO diagnosis results were discussed with CR’s management team and an arrangement was made to repeat the diagnosis every two years, with limited metering conducted in-between. The intention was to strive for improved HPO scores at each assessment. The Customer Relations staff was composed of 120 teams, split among five regions in the Netherlands. 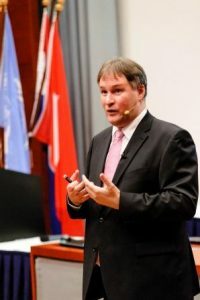 Inspired by Theory U (Scharmer, 2009) — which proposes that the quality of the results that are created in any kind of social system is a function of the quality of the awareness, attention, or consciousness of the participants in that system — the management team organized an awareness session for each team. In these sessions, root cause analyses were made of the issues that surfaced in the HPO diagnosis as a first step in devising effective solutions. The goal of the sessions was to open participants’ minds, hearts, and wills regarding the HPO transition (Scharmer, 2009). Since the HPO framework is aimed at the organizational level, management decided to use an alternative instrument on the team level, the Perspective/Macrolook meter (Hatchfund Nederland, 2009a). Through questionnaires and “weather icons” (“Is it raining on our team, is the sun shining, or is it cloudy?”) employees indicated how they felt about the Customer Relations department and their particular team and whether they thought they could realize their ambitions with their current competences. Now, nearly six years after the start of the transition to HPO in the Ziggo Customer Relations department, it is possible to unequivocally conclude that the change approach achieved its intended effects. The results of the CR scorecard show that sustainable improvements have been made on individual, team, and organizational levels, and that cooperation with partners has significantly improved. This translated into Customer Relations achieving an all-time high customer satisfaction score for its industry of 7.5 out of 10. In a relatively short period of time, the organization was able to boost its HPO level by approximately 10 percent (see Exhibit 2). The HPO framework offered managers and employees an accessible vocabulary to help them clearly speak about their daily work life and continuous improvement efforts. More than 70 percent of the goals listed in the Customer Relations department’s improvement plans have been realized, the development level of the teams has increased significantly, and employee satisfaction scores increased by 13 percent. Employees believe that they have been given more leeway to handle their responsibilities, they have shown a greater willingness to change, they feel more personally invested in the ups and downs of the Customer Relations department, and are proud to be working there. The Customer Relations teams cooperate more easily, and the HPO framework provides them with a clear-cut standard of working. This has translated into improved financial performance: Between 2009 and 2013, Ziggo’s profits almost doubled. Not everything went according to plan, however. The attainment of several prizes, certifications, and other forms of recognition have not been realized, primarily because internal changes required a great deal of energy, often at the expense of attention to external audiences. In addition, the 10-percent increase in customer satisfaction has not yet fully translated into financial performance and the Customer Relations department needs to ensure that this high level of satisfaction becomes the norm rather than the exception. To this end, Customer Relations has begun a quarterly “Passion for the Customer” improvement initiative in which a CR employee who has received customer feedback for having delivered exceptional service is rewarded with a plaque and a gift (Waal and Heijden, 2013). The next step for the Ziggo Customer Relations department is to evolve from its current status as an increasingly better performing organization into a stable and robust HPO. This is a challenge, but now that the Customer Relations managers and employees know what changing entails, how intended results have to be made measurable, and which types of change and communication interventions work best, this certainly is not an impossible task.